Dogfish Head's Namaste is a Belgian white, brewed with orange slices and herbs, and it's a very slight beer. The color is a hazy, pale yellow, and there is nominal head. The aroma is so mild that I pick up on nothing more than a very small, musty malt in the background. The flavor is mild, too. A little citrus on the exhale, a barely-detectable amount of spice, and it's gone. Not DFH's best. Stone and other breweries have collaborated on some imperial IPAs this summer, and the ones I've had have been delicious. I loved Collective Distortion, and I like Unapolgetic IPA every bit as much. This imperial is a true experiement, too... the brew incorporates experimental strains of hops that are so new they haven't even been named yet. This is like getting a taste of what might be commonplace in a few years, and the future looks bright, dry, and bitter. I love it. Unapologetic pours a light gold color with average head and lace. The aroma is mild. I picked up on a little malt, a little bit of white grape, some cantaloupe. The flavor is kinda like a dry version of Stone's Enjoy By IPA, and it's delicious. Enjoy By's tropical and citrus notes are there, but they're not as juicy and not as forward. The finish is strong and bitter, and the 9% ABV is a definite presence on the tongue and in the nose after the sip. Stone, Beachwood and Heretic knocked this one out of the park. I know a lot of people are getting tired of IPAs these days, and I admit that there are a zillion of them on the market. But big hops are absolutely Stone's domain, nobody does the composition better. When Stone works with other breweries on new variations on the style, it seems to bring out the best in everyone. Speaking just for me, I don't care how many of these hopped up monsters are on the shelves these days. I hope Stone keeps churning them out. It's like a long jam by a favorite band; I don't want it to ever end. I haven't reviewed much whiskey at this blog, and I always feel compelled to qualify the hell out of my whiskey reviews: I don't know crap about whiskey. All I know is what I like. That's true about beer and movies, too, but I've drank a ton of beer and seen a lot of movies. Whiskey is serious novice-territory for me. I'm less than a novice. I'm a total noob. But I can tell you that I like Tullamore Dew Irish Whiskey, and that for the price, it's one of the best whiskeys I've had yet. I'm certain that I'll buy it again. Tullamore Dew pours very pale gold in color, and the aroma is mild and sweet. There is vanilla all over the aroma, and some mint, some spice. The flavor is very mild, too. Downright subtle. Keep in mind that, when it comes to whiskey, I almost only ever drink Maker's Mark and Templeton Rye, so Irish whiskey in general is very new to me. This stuff is downright delicate compared to the bold and robust bourbon I'm used to. The flavor is malty with just a little mint, but not a medicinal, mouth-wash kind of mint like I associate with cheap stuff. The mint here is an afterthought; a ghost. The really surprising thing about a sip of Tullamore Dew, to me, is the finish. It's very quiet. No huge vapor, not a bit of aggression, this whiskey finishes as quietly and smoothly as a sip of water. That's not to say it's watery, because it isn't. But it's very smooth. Very clean. I'll be honest, bourbon and rye are more my style. I smoked for thirty years and that left my tongue almost incapable of enjoying delicate flavors. If food and drink doesn't hit my mouth like a sledgehammer, sometimes I can't enjoy it. But I think a bottle of Tullamore Dew Irish Whiskey would be good to have on hand for those evenings when I'd like something a little different from my usual. And with a price-tag that's more than ten dollars cheaper than my usual favorites (for the comparably sized bottle), I can see me warming up to this stuff pretty quickly. Green Flash's Road Warrior is an imperial rye IPA, and it doesn't play around. It pours deep, dark bronze with a ton of head and persistent lace. The aroma is typical rye beer; apples, rich malt, caramel, some citrus. The flavor is bigger and more bitter than the nose implies. Smooth rye on the sip; then huge, bitter, aggressive pine hops in the finish. The 9.0% ABV shows up in the nose on the swallow. This is a big beer. Smuttynose hasn't disappointed me yet. Their Finestkind IPA is a fine example of the style. It's cloudy, yellow ochre in color with a lot of carbonation and sticky lace. The aroma is mild, buttery malt and grassy hops. Very well balanced flavor. Cereal malt up front, then big bite in the finish. Strong resin, crisp finish, medium mouthfeel. Good price, too. Smuttynose does beer right. Chaos Mountain's 'Squatch Scotch Ale pours the color of iced tea with very little head. The aroma is caramel malt and some vegetable notes. The flavor is rich and smooth. A little pine in the finish. Mouthfeel is a little thin, but not bad. I enjoyed this. Great Divide makes good beer, and Rumble, their oak aged imperial IPA, is a good one. It pours a slightly hazy orange with an average head that leaves thin, soapy lace. The aroma is apples, malt, and alcohol. The flavor is better than I expected. I’m still not convinced that oak aging and heavy hops are the best combination, but it works here. Citrus up front, a rich malt, and at the finish the warm oak floods the tongue. Strong resin notes on the swallow. I've had to re-rate Epic's Big Bad Baptist so many times. This beer is so complex, so demanding, that I can never quite decide what I think of it. 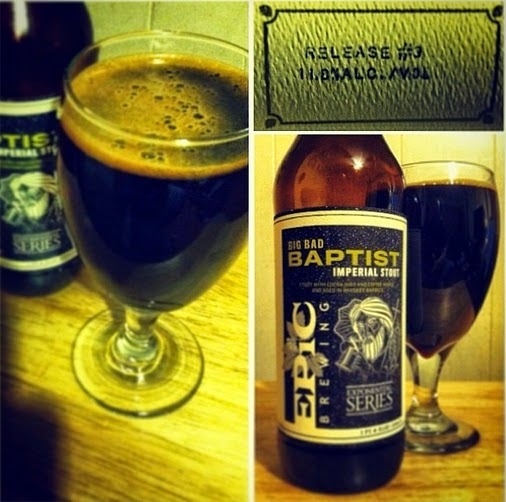 This is a bourbon-barrel aged imperial stout, which is brewed with coffee and chocolate nibs. So, right away, it has an edge as per my palate. 3B is sometimes my favorite beer of all time, but now and then it gets knocked down a peg or two by a new breath-taker. Tonight, I had a bottle of Release 3, which has about 2.5 years of age on it. It's perfect. Absolutely stellar. It is as good as, and arguably better than, KBC or Bourbon County. I admit, I've never had the patience to age KBC or Bourbon County like I aged this bottle. It's a little easier to age something if I know I can get a new bottle fairly easily. Nonetheless, with a few years of age on it, 3B is every bit as good as the legendary American stouts I mentioned above. Get a bottle of this and forget about it for a while. When you allow yourself to remember it, it will prove itself to have been worth the wait. 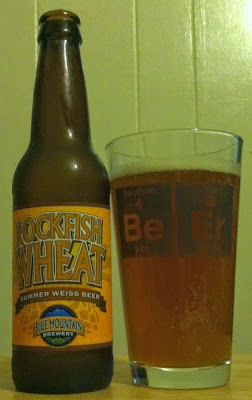 Blue Mountain's Rockfish Wheat is a German Hefeweizen style beer, and it's one of the tarter and stronger ones I've tasted. It pours a hazy, pale brown with a thin, brief head. The aroma is caramel malt and a little grass. The flavor is tart up front, more so than I expected. It took me a few sips to warm up to this beer, but I came to like it. The finish was rich and sweet; bananas and some citrus. Not my favorite hefeweizen, but not bad. Evil Twin's Hop Flood is a heavily hopped amber ale. It has a copper color, medium head, and persistent lace. The aroma is caramel and apples, but it isn't strong. There's not a lot in the nose from this one. The flavor is all malt up front, but the finish is well balanced. Sweet, rich malt behind a biting bitterness. Not bad. Ommegang's Hennepin is a strong farmhouse style ale, and it's more aggressive than many saissons I've had. I like that. It's slightly cloudy with a pale golden color with a huge head. The aroma is malt and mildly sweet fruit, but the flavor is dryer and stronger than the smell implies. This beer is not delicate at all. Grapefruit and bananas on the front, smooth malt and vapor on the back end. The nearly 8% ABV is present in the flavor. The finish is bright. This ale is substantial. Mad River's Steel Head Double IPA has a hazy, caramel color, a slight head, and thin lace. The aroma is bad. It smells fishy. It’s possible that this bottle has gone skunky. The flavor was better than the aroma. Rich, sweet malt with strong, citrus hops. There was an oily mouthfeel. This beer is generally well reviewed, so I might try it again just to find out if it's just that this was a bad bottle. Kona Longboard Island Lager is crap. Sunken City is a new Virginia brewery in Hardy. I just sampled their Red Clay IPA. I don’t know why they’re billing this thing as an IPA when it’s all about malt and it doesn’t feature any particular hop profile. Maybe this harkens back to a time when IPA’s weren’t all mouth-stompers? I don’t know. Having said all of that, this is a good beer. I like it. It pours mahogany red with a little head, the aroma is rich but not overstated. The flavor is really nice. Crisp up front and then all nutty, hearty malt. A little caramel in the finish. No presence of the 7% ABV in the taste. I’ll have this again.